2016 has been a godsend in regards to indie films. We’re seeing a constant stream of killer flicks that were shot on shoestring budgets, no support from major studios to speak of. But that hasn’t stopped hungry young filmmakers from giving us all they’ve got. 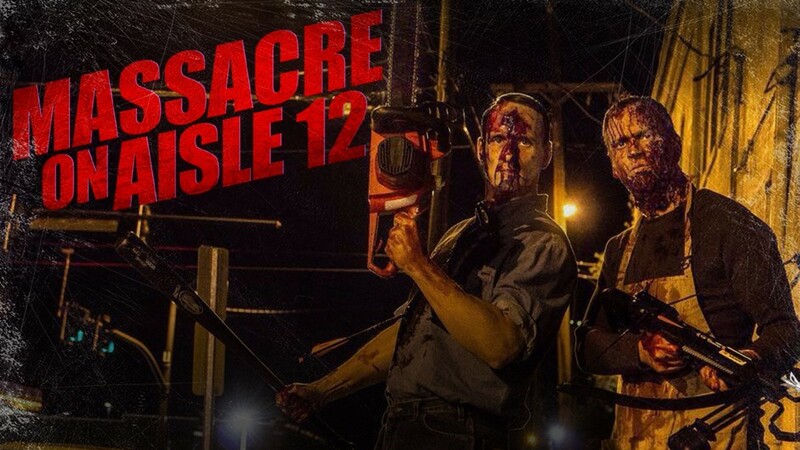 Such is the case for Massacre on Aisle 12, a promising little flick with all the makings of a future classic. If you’re having any doubts, just take a peek at the new teaser, which absolutely rocks… and jiggles! Jim Klock and William Mark McCullough (Patient Seven) direct from a screenplay written by Chad Ridgely and A.J. Via. The film stars Jim Klock (Scream Queens), Chad Ridgely (Murder Eleven), Mike Capozzi (Interrogations Gone Wrong) and Michael Buonomo (Gold Rush). The film is slated for its World Premiere at the Buffalo Dreams Fantastic Film Festival November 4th-6th. No word on wide release just yet! Synopsis: The bloodshed begins on Christmas Eve. As a hardware store begins to close, a duffel bag of cash is found, but so is a body. Now, the employees must decide what to do with both items. Should they turn the cash in, or go on a Christmas shopping spree? Events take an even bloodier turn when the employees turn on each other. Yeah,I wrote this movie! (Originally, Chad Ridgely did a rewrite on my script, so I can’t take ownership of it entirely.) Hopefully it gets a little run and some interest and makes a splash. I promise you’ll laugh if you go see it! I’m looking forward to it AJ!